Annual report examines 233 B2B accounts totaling nearly $4 billion in sum-contract value. AskForensics, a sales growth and data analytics firm that helps Fortune-ranked companies assess the health of their largest accounts, has released the 2017 B2B Sales Analysis. This annual report explores what made accounts strong, vulnerable or damaged in 2016, and what companies can do to strengthen accounts and win new sales in the future. 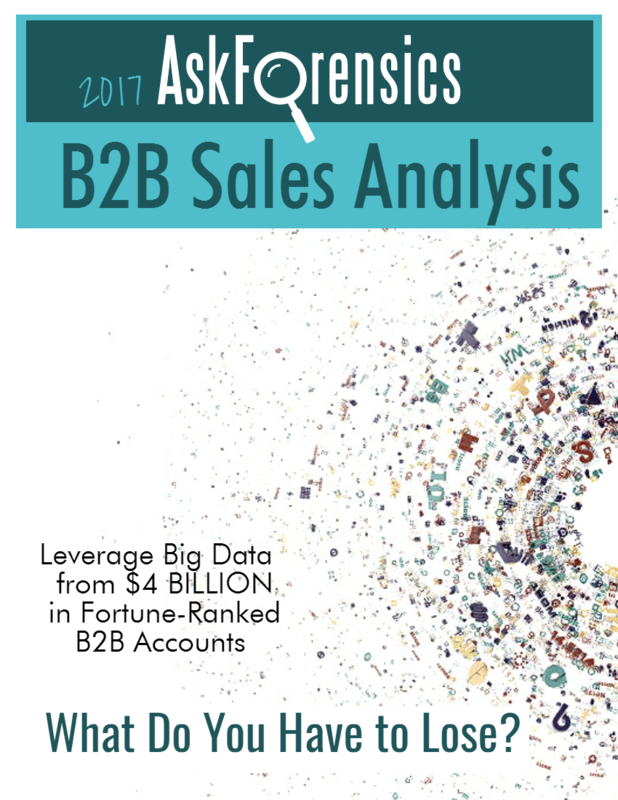 The 2017 B2B Sales Analysis has become one of AskForensics’ most popular resources due to its practical, data-backed insights. Readers will learn that most accounts are often vulnerable. They will also discover the top reasons that accounts were strong, vulnerable or damaged in 2016, plus how companies were able to turn things around. To create this report, AskForensics evaluated data from 233 business-to-business (B2B) accounts, which had been collected between 2012-2016. The average value of each contract was $16.9 million and the total contract value was more than $4 billion. The analysts also pulled qualitative and sales data from the AskForensics Knowledgebase™. This exclusive resource contains data on more than $14 billion worth of customer and prospect accounts of B2B selling organizations. The 2017 B2B Sales Analysis, as well as the graphs and infographics used in the report, are available for download at: http://askforensics.com/salesanalysis. AskForensics helps Fortune-ranked companies win and retain multi-million-dollar accounts. Its analysts rely on data and predictive analytics to draw objective, scientific insights about what's really happening behind the scenes with prospects and customers. Over the past 25 years, AskForensics has evaluated more than $14 billion worth of prospect and client accounts, generating millions of dollars in ROI for clients such as FedEx, Aramark, Equifax, Marriott, Red Hat Software and Coca-Cola.